THE PLATTE RIVER RIDERS SADDLE CLUB provides an opportunity to trail ride with other adults! Just meet at the pre-designated trail each Wednesday evening (Thursday for those northern riders) and enjoy up to a three-hour ride. There are no dues or trail bosses. And no, this is not a singles club. J It’s just another way to enjoy your horse with other like-minded folk. Be saddled and ready to ride by 6:30 PM. Rides start in early April and will conclude in mid-September. Join us for one or all the rides. New riders are always welcome! No need to pre-register; just saddle-up and ride. BE PROMPT! All riders appreciate participants being saddled and ready to ride by 6:30 PM. It's a weeknight and we are burning daylight so there is no time to waste for late comers. It will be up to those who run late to catch up with the group. This is the best way to manage everyone's time. BE SAFE! Use good trail manners. If you don’t know, ask. Clean up after your horse at the trailer. No unleashed dogs (state park rule). Stay off muddy trails! Be courteous to other riders. DIRECTIONS Visit Horsetrailriders.com for information about the horse trails and to locate the trail head or post on Facebook for help. RIDE UPDATES and QUESTIONS Facebook is your friend! 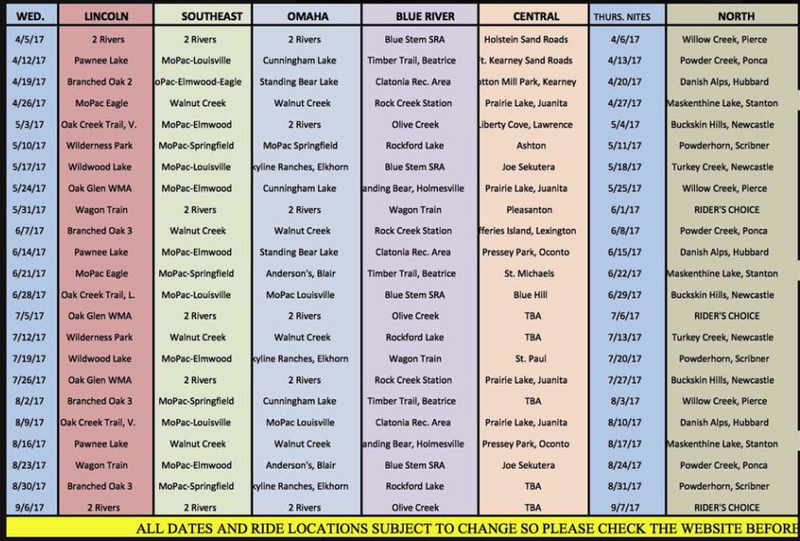 Please visit the Platte River Riders Facebook page for updated information about that evening's ride. Weather cancellations or last minute changes will be posted on Facebook. If you have a question about the ride, ask away. Any PRR Facebook member is happy to help. We love ride reports! Pictures and stories are welcomed and encouraged on Facebook! IT'S WEDNESDAY, LET'S RIDE! 1 - Use good trail manners. If you don't know, ask. Be a good trail user. Be respectful to other trail users and follow all rules regarding that specific trail. Horse trails are a privilege, not a right. 2 - If your horse kicks, tie a red ribbon on his tail. Stallions are allowed and should sport a yellow ribbon on his tail. If a situation arises between another horse and a stallion, the stallion will be asked to leave the group. 3 - If you are going to change the pace of your ride, please go ahead of the group or stay behind the group and always tell the group of your intentions. Never run up on the group or another individual rider if you have elected to stay behind. 4 - Bring a shovel & clean up any manure left around your trailer before departing the trail head. 5 - It is your responsibility to purchase required park permit or pay access fees when required. If the ride is across your state line, you are responsible for the appropriate health and Coggin's papers. Be informed. 6 - Do not litter. Pack out what you pack in. 7 - No dogs allowed on the trails. 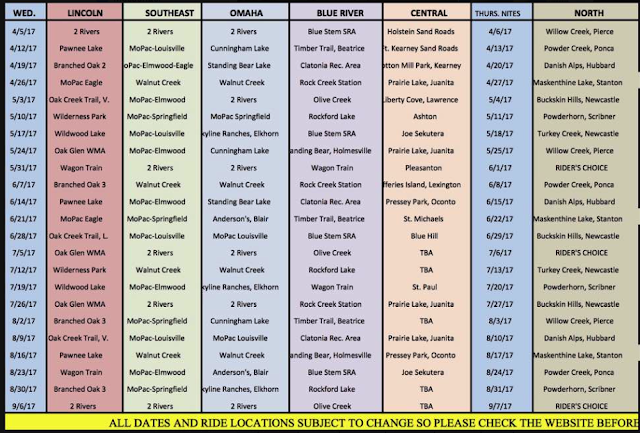 8 - If the trails are muddy and riding the trails will cause damage, it is the policy of the Platte River Riders to NOT ride those trails. Let’s save it for a better day! These are "our trails". If we abuse it, we will lose it! 9 - As a courtesy to other riders, please be sure your horse is up-to-date on vaccinations. If your horse has been sick, it is suggested you wait 10 days from last symptoms before joining the group.